These are the first well-documented bronze coins of Miletus, and the first Milesian coins in any metal to carry inscriptions. They correspond to #258–303 in the monographic study of Deppert-Lippitz (1984), and combine the standing regardant lion of the subsequent Apollo/lion silver and bronze issues with the ornamental sun design common to the silver twelfth staters of the sixth century. In his recent revision of these issues, Philip Kinns identified four subtypes among the specimens studied by Deppert-Lippitz, as shown below; he placed these subtypes in their likely chronological order; and he added a new subtype (here 1a) which he regarded as the earliest of all (Ashton and Kinns, 2003: 5–6). Obverse: lion regardant standing left with city monogram ΜΙ to left and letters ΠΕΡ or ΡΟΜ above lion. Reverse: sun/star with no lettering. A rare subtype, with only three specimens recorded by Kinns, two with ΠΕΡ ( BMC #49 and SNG von Aulock #7932) and one with ΡΟΜ ( BMC #50). “All three coins appear in D-L’s catalogue, but as ‘illegible’ (290–1) or ‘without name’ (302)” (Ashton and Kinns, 2003: 5). Specimen RJO 80 below, with inscription ΠΕΡ, is a fourth specimen of this subtype. Obverse: lion standing left and facing forward with ΜΙ monogram to left and letters ΠΕΡ or ΑΛΙ above lion. Reverse: sun/star with no lettering. No specimens of this subtype were known to Deppert-Lippitz; Kinns records only three, one with ΠΕΡ (Ashton and Kinns, 2003: 6, pl. 1A) and two with ΑΛΙ (Ashton and Kinns, 2003: 6, pl. 1B, and Winterthur #3352, previously attributed incorrectly to Halicarnassus). 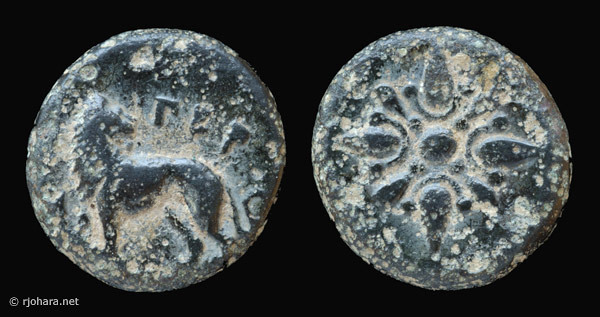 “The obverse type shows a lion simply walking to left, with head pointing forwards, a feature which should be regarded as experimental and therefore a clear indication that these are the earliest inscribed coins of Miletus. For once these types had become standardised there is not a single subsequent instance of a lion with head not turned back, throughout the course of three centuries of coinage” (Ashton and Kinns, 2003: 6). Obverse: lion regardant standing left with city monogram ΜΙ to left and small sun/star above lion. Reverse: abbreviated magistrate’s name ΑΛΚ between the rays of the sun/star. Also a rare subtype, with only two specimens recorded by Kinns ( BMC #45 and SNG von Aulock #7933). “The BM coin is listed by D-L (259) with other coins (from sub-type 3) showing the fuller inscription ΑΛΚΙΠΠΙΔ on reverse, whereas the von Aulock coin is listed wrongly under the name Aphobetos (269)” (Ashton and Kinns, 2003: 5). This is the subtype illustrated by Sear (1979: #4514, citing BMC #45). Obverse: lion regardant standing left with city monogram ΜΙ above lion. Reverse: sun/star with no lettering. “This is certainly a separate variant (D-L 297ff), with some examples showing ‘ground’ or perhaps even waves below the lion, instead of a plain ground-line, but it can easily be confused with worn coins of 3), on which a name has become illegible (D-L 289ff). Chronologically it could belong with 3), but does not appear to be early. Note the ‘standard’ position of the city monogram, in contrast with 1) and 2)” (Ashton and Kinns, 2003: 6). Deppert-Lippitz had dated these coins to about 352–325 BC, after the death of Mausolus, on the grounds that autonomous issues such as these would not have appeared while Mausolus had control of Miletus. Kinns places them about 370 BC, during the time of Mausolus and a decade or two before the commencement of the long-running Apollo/lion series in silver and bronze, arguing that “the hypothesis of Hecatomnid control [of Miletus] is far from strong, depending largely on the ΕΚΑ and ΜΑ coins [issued in silver by Hecatomnus and Mausolus], whose attribution to Miletus is only conjectural…. Furthermore, the Hecatomnids (right down to Orontopates) are not known to have issued bronze coins in their own names and types, which must mean that the provision of small change was left to lower authorities. In other words, even if we accept the hypothesis of Hecatomnid control of Miletus, it can have no bearing on a putative bronze coinage of the city” (Kinns, 1986: 249; but see Kraay, 1976: 253). The presence of lettering between the rays of the reverse sun on these Milesian bronze coins was surely the source of, or was derived from, the similar reverse lettering seen on the small silver issues of Hidrieus and Pixodarus. The names appearing on the Hecatomnid coins always seem to be those of the satraps themselves, while the various names appearing on these Milesian bronzes are presumed to be those of local mint magistrates (although this is not proven). (1a) An earlier bronze issue of Miletus? A few bronze coins exist in the types and dimensions of the silver twelfth staters of sixth-century Miletus. Konuk illustrates two from the Kayhan collection (Konuk, 2002: #488–489), said to have come from a hoard discovered near Phygela. He dates these bronzes to 400–380 BC. See Klein (1999: #439) for an additional specimen (also BMC #42 and SNG Tübingen #3026, not seen). These early bronzes were not considered by Deppert-Lippitz (1984); “they will be discussed in greater detail in a volume on the early bronze coinage of Asia Minor to be edited by K. Konuk” (Ashton and Kinns, 2003: 5). 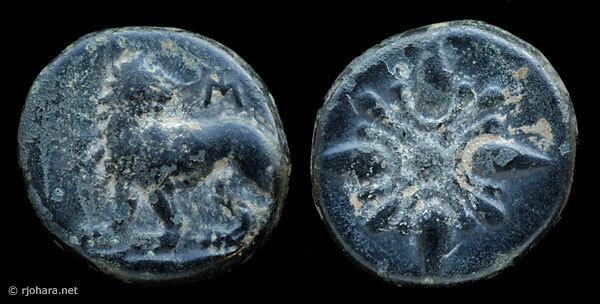 This type is easily recognized and is unlike any other Milesian coin. Only one denomination is recorded, and the subtypes differ only in the minor details that are noted above. Apart from the experimental issues with the lion facing forward, the ΠΕΡ and ΡΟΜ coins of Subtype 1 are the first inscribed Milesian bronzes, as well as the first Milesian coins in any metal to feature a standing lion, a device that will appear on the city’s coinage for the next three hundred years. RJO 80. Bronze 12 × 13 mm (2.44 g), about 370 BC. Obverse: lion standing left, looking back at letters ΠΕΡ; ΜΙ monogram (partly off flan) to left. Reverse: ornamental sun with no inscription. Compare Ashton and Kinns (2003: 5–6, Subtype 1). The coins of Subtype 3 feature the city’s ΜΙ monogram above the obverse lion, and lettering between the rays of the reverse sun. RJO 85. Bronze 11 × 13 mm (2.58 g), about 370 BC. Obverse: lion standing left, looking back at ΜΙ monogram. Reverse: ornamental sun with letters Α[Λ]ΚΙΠΠΙ[ΔΗΣ] between the rays. Compare Ashton and Kinns (2003: 5–6, Subtype 3). The coins of Subtype 4 feature the city’s ΜΙ monogram above the obverse lion, and no lettering on the reverse. RJO 21. Bronze 13 × 14 mm (2.39 g), about 370 BC. Obverse: lion standing left, looking back at ΜΙ monogram. Reverse: ornamental sun with no inscription. Compare Deppert-Lippitz (1984: #297–303) and Ashton and Kinns (2003: 5–6, Subtype 4).